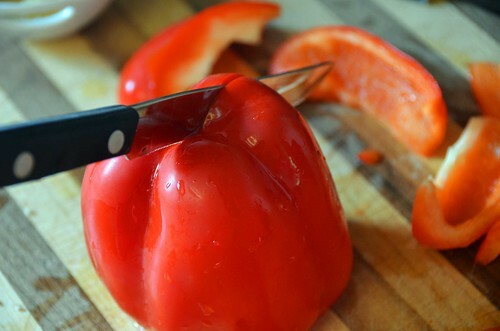 I’m always looking for good ways to serve vegetables and fruits. My kids and, frankly, I get tired of eating carrot sticks or steamed broccoli, apple slices or oranges. One of my favorites recently is bruschetta. It’s packed with tomatoes and fresh herbs and it’s a lot more appealing than handing your kids a tomato and telling them to chow down. I like to think of bruschetta as pico de gallo’s long lost Italian cousin. Get rid of the onions and peppers and exchange basil for cilantro and you’re set. 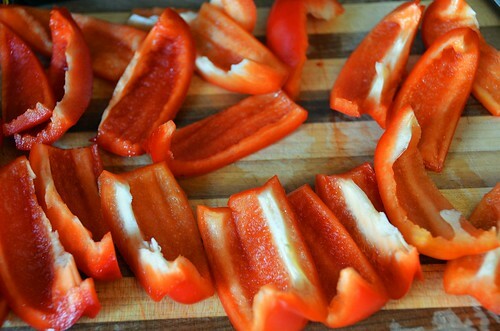 My current favorite bruschetta recipe is below. 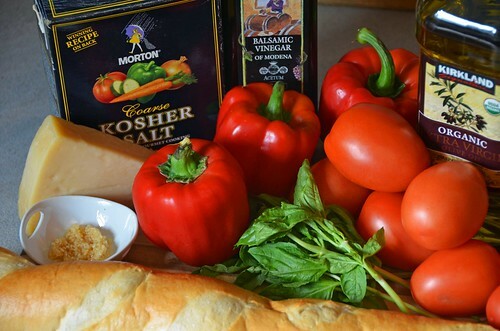 It’s made with balsamic vinegar and tastes great on a sliced baguette or with pita chips. My kids eat it willingly, if not enthusiastically, and it was a big hit when I made it for book club a while back. 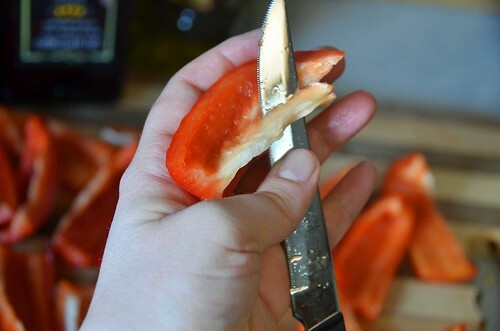 Dice your Roma tomatoes finely. This tastes best if they’re deep red, fully ripe. These were not quite ready. 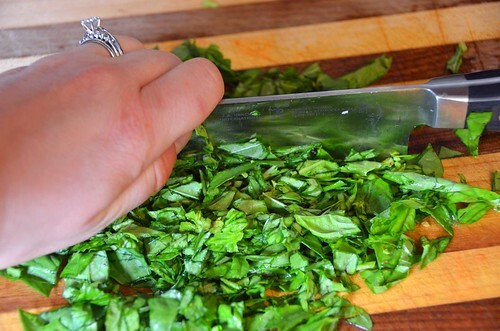 Remove the basil leaves from the stems and chop your fresh basil to about this consistency, maybe a little finer. Please never use dried basil for bruschetta. If you don't have fresh basil and you’re in a pinch, make something else. 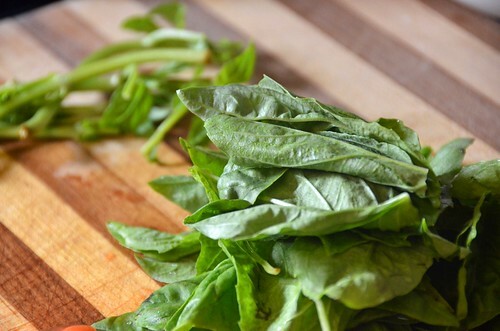 The taste of fresh basil is really the heart of this recipe. A thought on basil - If you can, buy living basil. During the summer months you can get really great healthy plants at Trader Joe's, Whole Foods or your local farmers' market that will grow and give you more than your money's worth of basil, fresh whenever you want it. Just be sure to snip off the ends at the first sign of flower growth. Once basil goes to seed, it becomes bitter. This month I found a sort of weak-sauce plant at Safeway that's been doing okay on my window sill. The next best thing is one of those big tubs available at most grocery stores near the packaged spinach. It may seem like a lot, but you can always use any extra basil chopped up in a salad to give it a boost and the price you pay for those tiny little fresh herb packs is ridiculous. 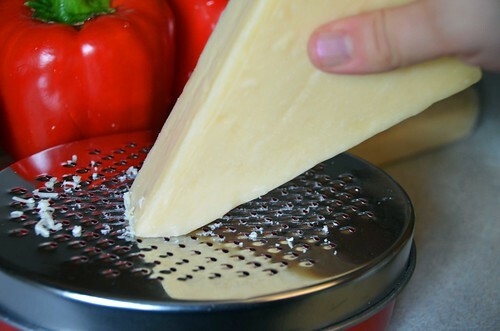 Grate your parmesan. Buying a brick and grating it is best. Buying real parmesan pre-shredded is okay. If you were to use Kraft parmesan in the green tube with no fillers, it would probably be edible. Add the parmesan to the bowl. Next add your 2 cloves of diced garlic. I’m lazy when it comes to garlic and, although I know fresh is best, I usually settle for a teaspoon of the jarred pre-diced garlic from Costco. Mix those up and then drizzle the liquids over top and sprinkle on some salt and pepper. Stir. 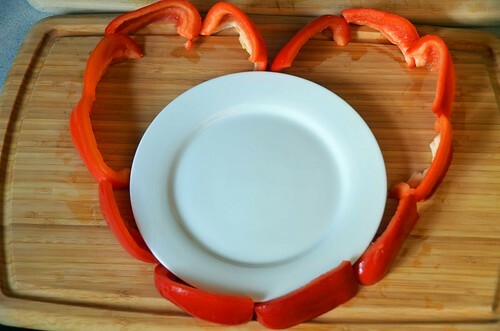 For some Valentine’s Day fun, I seeded and sliced red bell peppers and put them around the platter in the shape of a heart and then filled the heart with bruschetta. 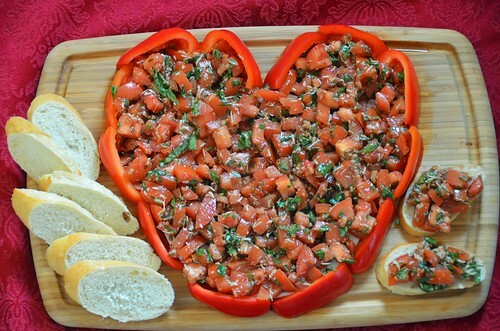 It’s a cute idea but in order to make it work without leaking all over the place, you need to completely drain any of the bruschetta that’s not on the plate in the middle or face the consequences of a leaky heart. 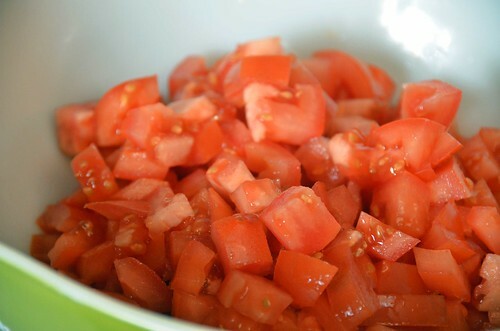 Place the diced tomatoes, fresh basil, parmesan cheese and garlic in a bowl. Stir gently to combine. Drizzle with vinegar and olive oil and sprinkle with salt and pepper. Stir once more to combine. 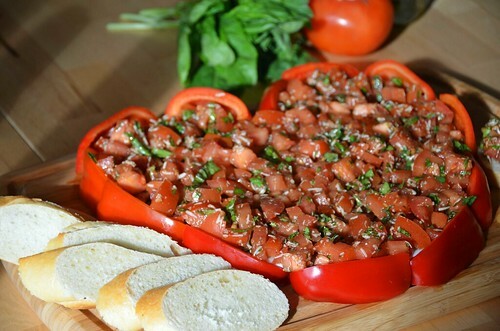 Spoon generously onto sliced French bread or scoop up salsa-style with pita chips. Great recipe. Love the maple and walnut cutting board. Nice ring, too. I love those things too!